For long I have wanted to buy bitcoins but never got a chance until recently. When I was looking at options to buy Bitcoin, I found a few sites like Cex, Changelly & Coinbase where I can use real cash to buy Bitcoin. Luckily, I had about $119 in my Amazon account (Courtesy of my friend who gifted me an Amazon gift card). This was when I got to know about this popular online service called Purse, where one can use his Amazon gift card to buy Bitcoin. The Purse is San Francisco-based company, right in the silicon valley. The process is pretty simple as you will be trading in your Amazon gift card money in return of Bitcoin. 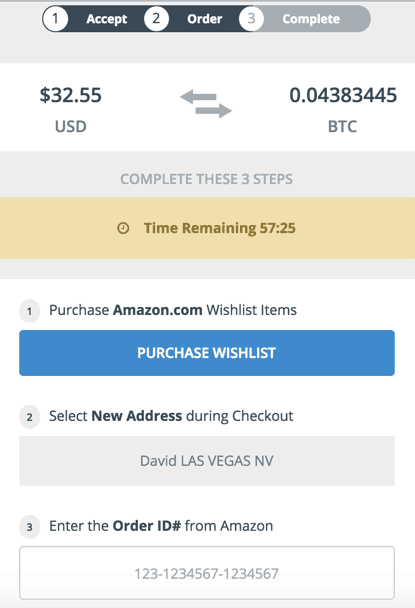 In this guide, I will show you how to go about it with actual steps (Pictures) & let’s buy your first Bitcoin using Amazon gift card. Amazon account (You can use an existing gift card or you can also use any other method to load money into your account). The Purse is a marketplace which connects Amazon shoppers to users with Amazon gift cards. Here, users with gift cards can liquidate their gift card at a nominal price. Ex: $80 for a gift card worth $100. Moreover, if you are someone who is just starting out & want to buy Bitcoin in a small quantity, using a gift card is an easy way. Though if you wish to buy Bitcoin in the larger amount, you should rather use other methods like real cash to purchase Bitcoin. Now, let’s move ahead & trade our Amazon gift card for Bitcoins. 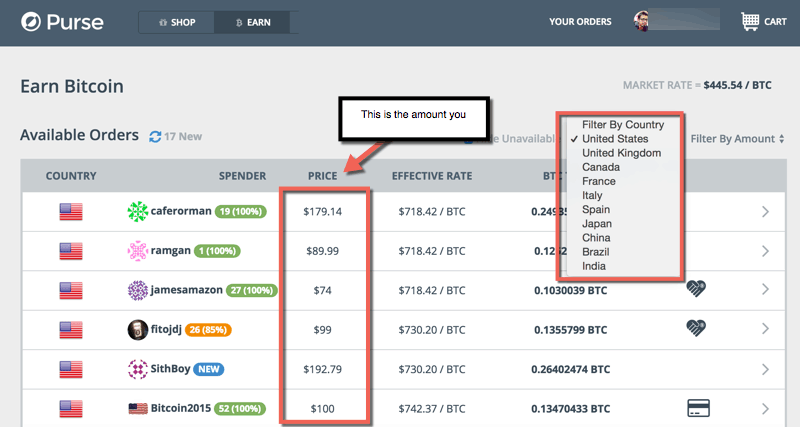 Log-in to your Purse account & click on earn bitcoin at the top. This will take you to a page where you can see many shoppers from Amazon who has listed their wishlist & you can sort it based on few factors such as Country. For this guide, let’s select the USA as the country. Click on Accept offer & this would take you to the Amazon site. Once you accept the offer, you have about one hour to complete the offer. Click on Purchase wishlist & it would take you to the Amazon site. At times after adding order on Amazon, your cart could be Empty or for some reason, if you couldn’t complete the order, you can always cancel the offer. From here, all you need to do is; complete the order & copy the order ID back to the form shown above. Once the order is delivered to the shopper & he confirms it, the money will be credited to your account. Don’t worry about fraud here, as money is kept into Escrow. You can always check the status of your Amazon order over here. Cool, not I got to wait about one week before receiving the Bitcoin using Purse. 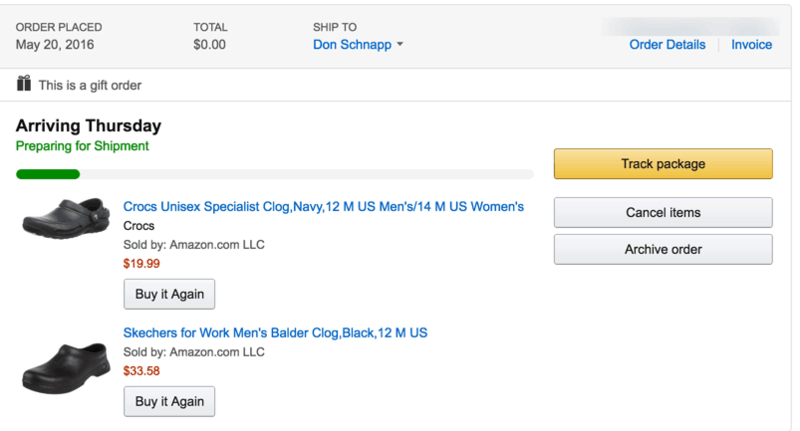 If you have extra Amazon gift card & want to sell it, Purse.io is a pretty neat way. 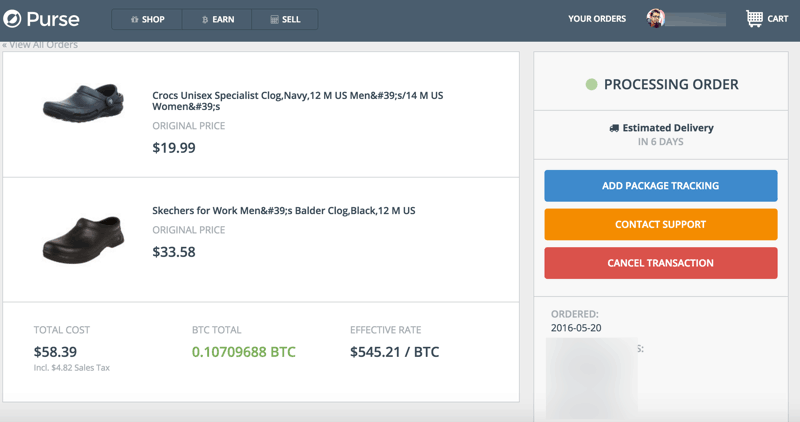 You can use earned Bitcoin to buy a lot of stuff as many online services accept Bitcoin. In coming days, I will be sharing all my Bitcoin learning here at CoinSutra. You can subscribe to our updates (FB, Twitter, RSS) to join my journey to the Bitcoin world. harsh i have amazon gift card balance of 5000 rupees and want to convert into btc.is it possible? With Purse, you can do that! i mean can i purchase other people’s wishlist products using my gift card with INR and not dollar? will purse convert my inr gift card balance to usd gift card balance and make the payment?? look for amazon wishlisters that are from India, so that you can use Amazon India GC in Ruppe currency in purchasing his wishlist. Hi Harsh, I want to accept bitcoin in my e-commerce site where I want customers to pay by card or PayPal and I receive in bitcoin. There are coin payment gateways but they require the user to already have bitcoin. Technically you want to use the money to get Bitcoin. For now the only option for you is to buy directly from Bitcoin exchanges. Search for My Ether Wallet or Metamask and you will learn more about creating and using an Ethereum wallet. Harsh, Have you written any post on how to use iTunes gift card to buy bitcoins? @Kingsley Not yet but will write about it soon! Hi Harsh, I have 250$ Amazon gift Card to buy Bitcoin please can you try and guide me on again or where can i sell it for bitcoin fast? Purse.io is indeed the best. where do i redeem my gift card to reflect on my purse to withdraw the btc? Hi, i dont have any amazon ‘cards’, but i do have credit in my main amazon account. Can i buy any bitcoin with my amazon balance, or must it be a physical card|? As far as you are talking about the “Purse.io”. 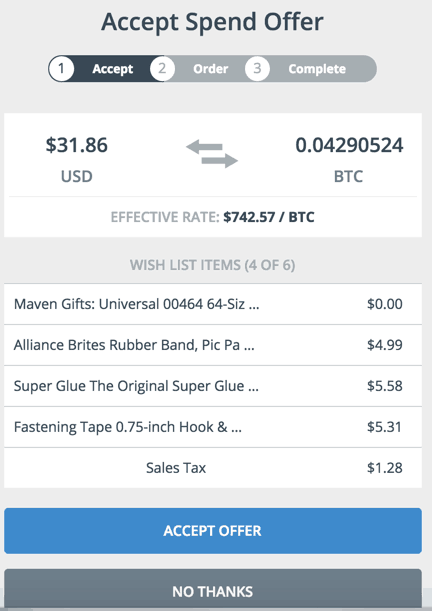 You obviously can buy the product (wished by the user on “Purse.io” in exchange of bitcoins) using that balance. Thank you, so i can actually buy through amazon using my credit on there. You have done a great Job. Even in 2018, I didn’t find any good article and more informative than this one. It would be great if you reply with the links where I can sell my bitcoins with Western Union. Other than Paxful and Localbitcoins.